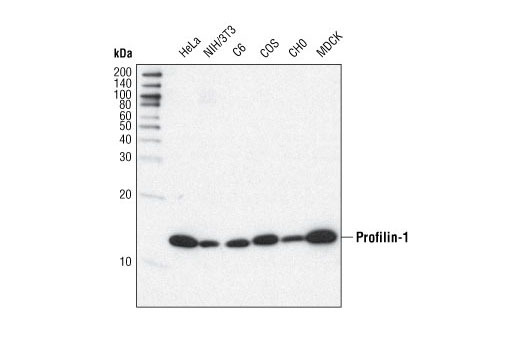 Profilin-1 (C56B8) Rabbit mAb detects endogenous levels of total profilin-1 protein. The antibody may cross-react with profilin-2. Monoclonal antibody is produced by immunizing animals with a synthetic peptide corresponding to residues near the amino terminus of human profilin-1. The dynamic polymerization and depolymerization of actin filaments, a process governed by external and internal signaling events, is vital for cell motility (immune cell function, migration, invasion, metastasis, angiogenesis), cell division and adhesion. Among the many regulators of actin dynamics are profilins. Profilins are conserved actin binding proteins that affect the rate of actin polymerization by binding actin monomers and promoting the exchange of ADP for ATP (reviewed in 1). Profilins bind to proteins involved in the regulation of actin dynamics including palladin (2), dynamin-1 (3), VASP (4) and N-WASP (5). In mice, knockout of the ubiquitously expressed profilin-1 indicates that the protein is essential for embryonic development (6). Profilin-2 is primarily expressed in brain and functions in the regulation of neurite outgrowth (7), membrane trafficking and endocytosis (3). The recently cloned profilin-3 is expressed in kidney and testes (8). Witke, W. et al. (2001) Proc Natl Acad Sci U S A 98, 3832-6. Da Silva, J.S. et al. (2003) J Cell Biol 162, 1267-79. Hu, E. et al. (2001) Exp Nephrol 9, 265-74.